Because of that last point, I asked my Facebook and Twitter friends to help. Last time, I had major problems getting the lumps out of the batter, and the pancakes themselves wouldn't stay coherent and broke. However, everyone had their own idea as to what was the magic trick, often completely contradicting. So, I took some advice, discarded some, and ended up with these. And they were great. Batter was non-lumpy, they didn't fall apart, and they tasted good. Titus ate seven. (Plain - he doesn't like jam, yet.) I topped mine with lovely cherry-violet preserves. Mmm. And the only suitable thing to drink with pancakes is milk, by the way. Mix the eggs, flour, salt, vanilla and 100 ml of milk. Whisk by hand, or with a handheld blender (that's what I did) until smooth. Gradually add more milk, until all is added, and then add the water. Leave the batter for about 20 minutes, and then fry thin pancakes in plenty of butter, on medium-high heat. You got me with your last remark... didn't expect THAT in a million years! These are beautiful...much prettier than mine! I will have to try your recipe after I use up my last box of Swedish pancake mix. 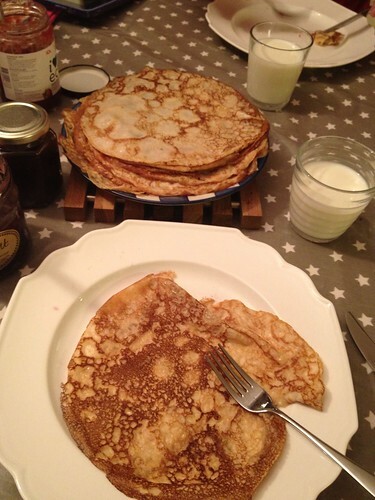 I love Swedish Pancakes, and these looks really yummy!